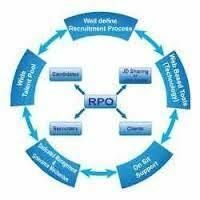 We are one of the well-known HR & Placement Consultants in Jaipur, and are engaged in providing remarkable Recruitment Process Outsourcing Services to clients. The Recruitment Process Outsourcing plays an important role for the clients, as it helps to fulfill the goals of a business in terms of saving time and cost to manage the HR department. The Recruitment Process Outsourcing Services offered by us includes Payroll Administration (issue checks, tax etc. ), Employees Benefit Administration (health, medical, life insurances etc. ), HR Management (hiring, recruiting etc. ), Risk Management (compensation, resolve disputes etc.). We generally provide our prompt services to the industries like IT/ ITES, Human Resource, Finance, Sales & Marketing, Retail, Engineering/ Technical, Telecom/ Technology/ ISP, FMCG and many more.